This year, the Scott Dunn Charitable Trust donated £15,000 to the Tusk Trust supporting numerous conservation and community projects in Africa. 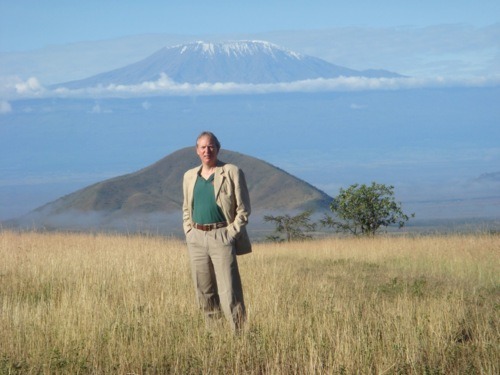 We meet Charlie Mayhew, co-founder and Chief Executive of the Tusk Trust who tells us more about how the trust began and how you can get involved. When did you first visit Africa? I first visited South Africa in 1979 as part of my gap year. I loved it but realised then that I simply had to see more of the continent in order to see the ‘real’ Africa. In 1985 I organized and led a trans-Africa expedition driving from London to Cape Town via the Sahara, Congo, and East Africa. An unbelievable experience! What attracted you about the continent and do you have an enduring memory? I love the raw beauty of Africa and have always had this strange sense of belonging – a feeling of coming home every time I visit. How did you get involved with Tusk? I co-founded Tusk in 1990 at the height of the ivory and rhino horn trade, but our aim was always to support conservation in its broadest form – all species and their natural environment. To achieve that we recognised that our projects had to embrace the needs of people too. Hence many of our projects incorporate sustainable development and education amongst rural communities. The charity has come a long way given we initially set it up as a hobby and never imagined we would end up attracting a Royal Patron! Can you tell us any new projects and initiatives this year? We currently support around 40 projects across Africa and our philosophy has always been to try and maintain our funding for these initiatives before embarking on new ones. However in recent months we have witnessed an alarming escalation in poaching of rhino and elephant. Therefore, much of our focus has been on strengthening security. What forthcoming events do you have in the UK that Scott Dunn guests can attend? Tusk stages a number of events each year which both raise awareness and funds. Coming up this Fall we have a variety of events which Scott Dunn guest might like to attend. On 2 November, we have our annual Lewa Dinner for 250 guests which is being held at the The Merchant Taylors Hall in the City. On 17 November, we have our regular American Express Conservation Lecture at the Royal Geographical Society, which is followed by a reception. The speakers will be conservationists Iain Douglas Hamilton and Tico McNutt who will be talking about their groundbreaking work with elephants and predators. Later in the year, on 5 December, we are staging a contemporary art auction event called Tusk Modern! The details for all these evenings can be found on our website. How can Scott Dunn guests become involved with Tusk? We would love any Scott Dunn guests to get involved and support our work. In addition to donating, they might like to consider taking part in our annual Safaricom Marathon, held at the Lewa Wildlife Conservancy. If you could recommend one place in Africa that Scott Dunn guests should visit, where would it be? I have so many favorite spots but overall I think I would say that Sarara Camp nestled in the foothills of the Mathews Mountains of northern Kenya remains my number one destination! It is quite simply breathtaking and so peaceful. It also represents one of Africa’s best examples of successful community conservation and a project that Tusk has been proud to support since 1998. Finally, what is your favorite animal and why? There are so many iconic species in Africa that it is really difficult to choose one! Elephants are incredible in so many ways, and lions and leopards are pretty awesome; gorillas for their likeness to humans; wild dogs are always exciting and rare to see, but I have always had a soft spot for the cheetah!